A few years ago now I bought an actual Paella pan. In my own defense there were a lot of pan sizes to choose from, as is often the case. From the diminutive, single portion size to the feed a town size. When viewed in this relative context one can easily choose a pan that is on the big size for your needs. 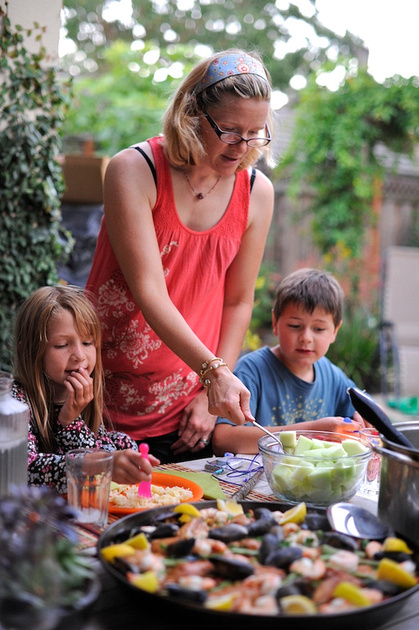 This is exactly what happened to me so when I go to pull the Paella pan out it is time to invite some people over. As many as we can find usually. 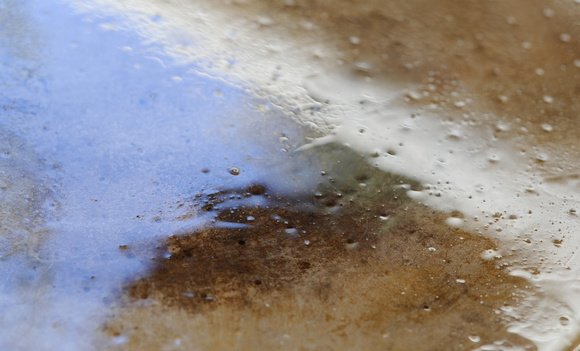 Here is a closeup of the pan showing the signature dimples. I once saw a food show of some sort that showed Paella being cooked over orange wood. 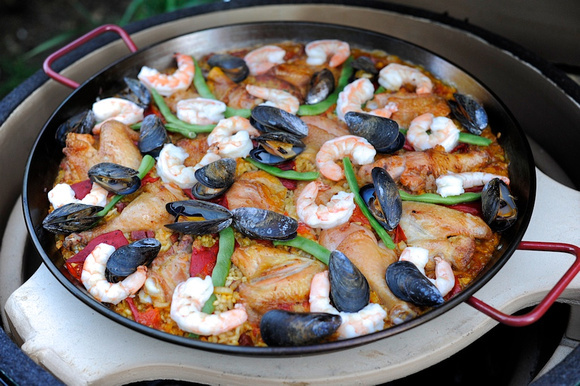 Of course this meant that I had no choice but to always cook Paella on the grill which leads me to the second part of the story. I’ve been in the market for a new charcoal grill and a recent, generous gift from my parents meant that I could afford the one I’ve been pining for. 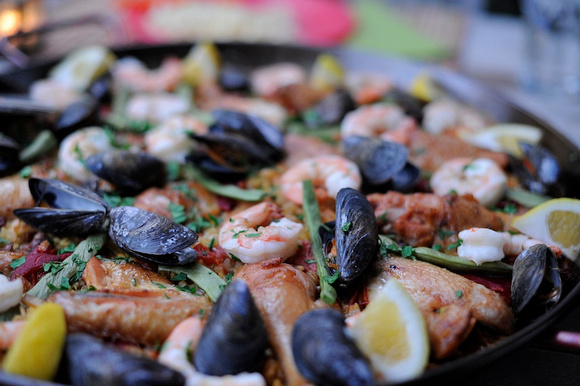 What better time to get it then for a Paella party. The one small aspect I overlooked was assembly of said grill. One hour before the guests arrived I had dessert done, cracker dough chilling, and chicken seasoning but had done little else. I realized I couldn’t finish the assembly in time so I reluctantly called off the assembly. My friends, upon arrival (and after the first bottle of bubbly and some homemade crackers) graciously volunteered to finish the job and set about the task. In fact they were a little upset we hadn’t called them over earlier to do it. Silly me always trying to do everything myself when there are good friends who would like to help! Anyway, I will post more about the new grill later as I learn how to use it. As is often the case when I get behind the blog suffers so my photo count is low and I don’t have any photos of making the Paella. Here it is finishing up on the grill. I will have to make it again soon since this calls for more photos. To say I have a recipe is to exaggerate a bit since I was really winging this. Instead let’s call it Paella Guidelines. I will also not pretend that this is authentic but I will say it is yummy. A few hours ahead season the chicken with salt (around 3/4 tsp kosher salt per pound), pepper, and smoked paprika to taste and put in the fridge. Pull chicken from fridge 30-60 minutes before cooking. Cook the shrimp shells in a large pot until they color and pour your stock over them and bring to a simmer. Preheat the oven or grill to 350. Heat the Paella pan (I start on the stove). Brown the chicken well on both sides and set aside. Add some olive oil and then the onions/shallots and chorizo and cook stirring frequently. Add some more smoked paprika and a splash of wine never hurt. When things are looking good pour in the rice and mix some more and allow to toast a bit. Then pour in most of the stock and make sure things are mixed and spread out well and check for seasoning. Place the chicken pieces and peppers around the pan and move to the grill or oven. Keep an eye on things. Probably about 20 minutes in I put the green beans in. Around 30 minutes in I added the shellfish. A lot of times people call for putting the shrimp in at the beginning but I just don’t like overdone shrimp. I added a little bit more stock at this point. When it is about time I tasted the shrimp to check on seasoning and for doneness. Season or add more stock/wine as appropriate. When it is done bring it to the table putting some nice lemon wedges around the outside and topping with some chopped parsley if its handy. I have to say it was good, especially the chicken. I think the early seasoning and then long amount of time on the grill absorbing some smoke made it really nice. The one thing we didn’t have in abundance was the crust you are supposed to get on the bottom. Not too bad for first try on a new grill though. Here’s a shot (taken by a friend!) of my wife with the kids looking on getting everything settled. I didn’t take wine notes but wines that were enjoyed include Lucien Albrecht Cremant D’Alsace Brut Rose (nice light, fruity sparkler), Harmonie 2010 Muscade Sevre et Maine (if you can find this it is very good for the price), Remelluri Eioja 2007 (a perfect match for Paella! ), Bedrock 2009 Sonoma Coast Syrah (a nice cold climate Syrah that I love). Tonight’s pairing was a Muscadet. This is a white from the Loire region of France made from a grape called Melon de Bourgogne interestingly enough. The price points are usually very attractive. I haven’t had Muscadet before and it was on the hit list. The Loire is known for Sancerre and this wine had a lot in share with a Sancerre (made with Sauvignon Blanc) even though it was a different grape. 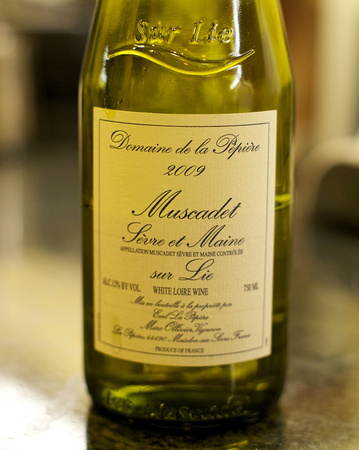 This was a Muscadet Sevre et Maine sure lie 2009 $13. Sur lie means it is left on yeast lies in the barrel. The nose was interesting with mainly apple and lemon zest but also melon and a hint of minerals. In the mouth it was quite tart and bright with a lot of lemon and mineral. Not terribly complex or long though. The normal pairing here is seafood or specifically oysters. It actually did quite well with the Vietnamese chicken and even the dessert cutting through the richness. I would definitely recommend the wine for the price if you are looking for something incredibly bright and light.